Jackie’s landscape paintings capture fleeting moments with spontaneity and vigor as she works from life, in the open air. Her rich color pallet and lively brushwork encapsulate not only the scents and sounds of the land but the people she encounters along the way. Wind, warmth, voices and memories are woven into her oils, overlapping strong abstract compositions of light, character and form. “Whatever the subject matter, I’m energized by the way light reveals essence and form; each creation a unique journey that carries it’s own emotive signature.” From country to city, some of her favorite places to paint are Block Island, RI, Colorado and New York City with her main concentration along the Connecticut Shoreline. 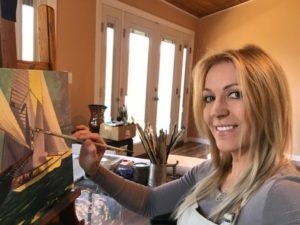 As a child Jacqueline studied with local artist Joseph Gionfriddo of Gilead, CT. A former student of Guy Wiggins and James Goodwin Manus, Gionfriddo instilled in her a love of traditional oil painting. Ms. Jones earned a Bachelor of Fine Arts Degree in Painting from the Lyme Academy College of Fine Art as well as a Associates Degree in Graphics from the Art Institute of Fort Lauderdale. She is the recipient of numerous awards including “1st Prize for Outstanding Work” at the prestigious Salmagundi Club in NYC. Stamford Hospital recently acquired a number of her works for their permanent collection. In July addition, Jacqueline enjoys teaching at the Glastonbury Art Guild, Marlborough Art Center and the Hillstead Museum. She often gives demonstrations and workshops for local art organizations. Her professional memberships include Allied Artists of America, American Artist Professional League, American Society of Marine Artists, Oil Painters of America, Catharine Lorillard Wolfe Art Club, The Connecticut Academy of the Fine Arts, The New Haven Paint and Clay Club as well as the Salmagundi Club in NYC. She is also a member of Glastonbury Arts, Essex Art Association, Lyme Art Association, and the Mystic Art Center.